Riviera’s ms Lord Byron sails the company’s Rhone itineraries through France. Photo courtesy Riviera River Cruises. 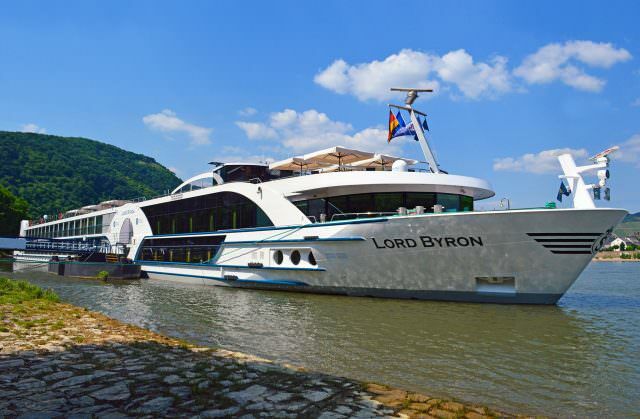 Launched in 2013, the ms Lord Byron carries 140 passengers and a crew of 36 on Riviera River Cruises’ Burgundy, the River Rhone & Provence itinerary. Lord Byron is a comfortable, cozy ship with classic décor that is based predominantly around dark woods and shades of blue and earth tones. 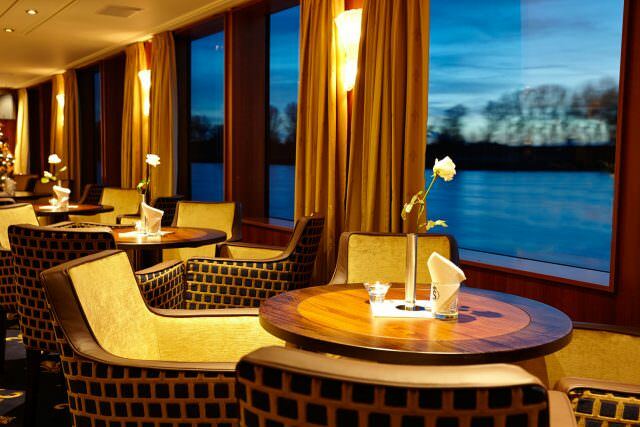 While not as elaborate as Riviera’s newer Thomas Hardy and her sister ships, Lord Byron and sister-ship Jane Austen nevertheless provide a relaxed, elegant river cruise experience on the rivers of Europe. Standard cabins aboard the ms Lord Byron have either small fixed windows or full French balconies, depending on your deck. 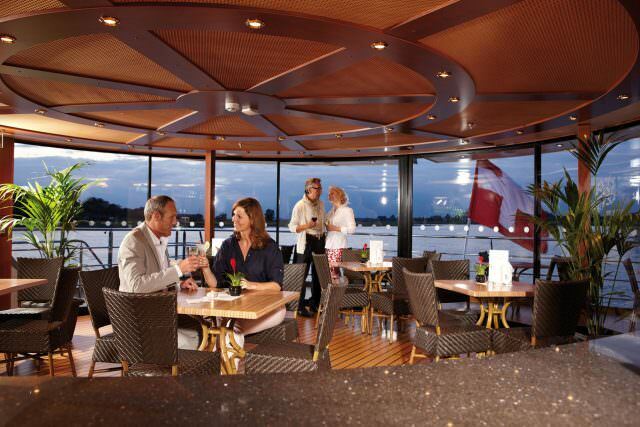 Photo courtesy Riviera River Cruises. Standard Cabins are the most economical type of accommodations onboard. At 161 square feet, they are decorated with attractive headboards, multiple lighting options, and have either queen or twin beds and a small but smartly-designed bathroom. Standard cabins on Emerald Deck feature quarter-height windows positioned near the top of the room, while standard cabins on Ruby and Diamond Decks have their own French Balcony. Superior Suites and Superior Stern Suites are a spacious 199 square feet and are available across all decks. Essentially stretch versions of Standard Cabins, these rooms add more personal living space, including a small sitting area and slightly larger bathrooms. Like Standard Cabins, Superior Suites located on Emerald Deck have quarter-height, fixed windows, while those on Ruby and Diamond Decks have French Balconies. A separate “Superior Stern Suites” category is identical, but is located at the extreme end of Diamond Deck. The layout in these rooms varies slightly, owing to the angled walls bordering the aft-facing Lounge. 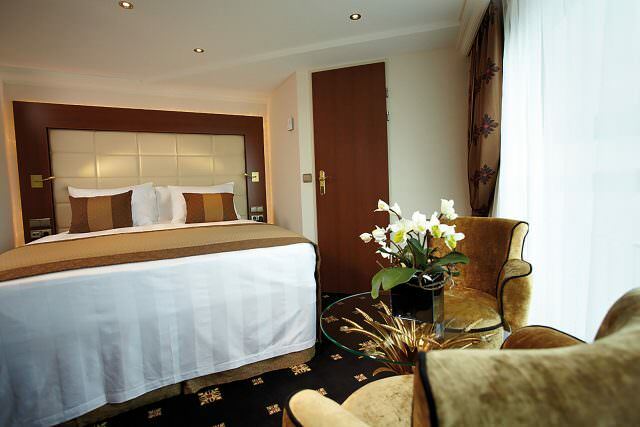 Deluxe Suites are the largest type of accommodations aboard the Lord Byron. Located on Diamond Deck, these four suites measure 242 square feet, and are nearly fifty percent larger than the ship’s Standard Cabins. All that extra space is used to good effect, with queen-sized beds (that can split into two twins) facing the French balcony, plus a sitting area with a full-size table and two chairs. Public rooms, like the main lounge, are spacious and well-appointed. 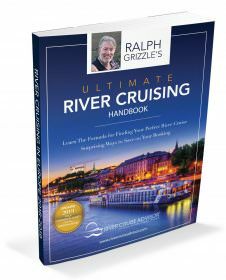 Photo courtesy Riviera River Cruises. Public areas aboard the Lord Byron are comfortable and intimate, and easily hold the ship’s 140 guests, even when sailing full. On Diamond Deck, the Lido Bar and Restaurant serves up light continental breakfast along with lighter fare for lunch and dinner. There’s no cost to dine here in the evenings, but reservations are required. Alternately, full buffet breakfast and lunch are offered in The Restaurant on Ruby Deck. Dinners offered here are elegant, multi-course affairs. The Lido Bar offers casual fare, in addition to the full offerings in the ship’s Restaurant. Photo courtesy Riviera River Cruises. The ship also features a 24hr self service station for tea and coffee, along with a full-service bar in the ship’s Main Lounge. Panoramic windows allow for views on three sides of the vessel, and the room exudes a cozy, relaxed feel. 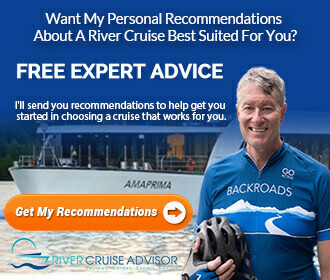 Like other Rivera River Cruises ships, bar drinks aren’t included in the cost of the cruise, but are reasonably a’la carte priced in Euros instead. Although the ship has a lift, it does not travel to the uppermost Sun Deck.